The NAB Cup starts this weekend and as we get to see more players perform, our teams will change… in some cases, for the 100th time! I have decided to post up a sample team that I have been working on. 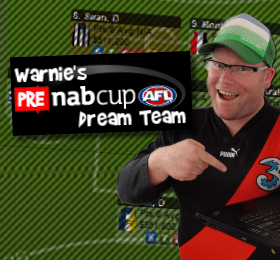 As the NAB Cup gets underway this weekend, I have decided to put together a bit of a team that is very similar to what I’ve been working on. There are a few different players here and there (which will obviously be changing over the next month or so). My main aim this year is to win the car. The main guys I see as ‘must-haves‘ this season are all there. 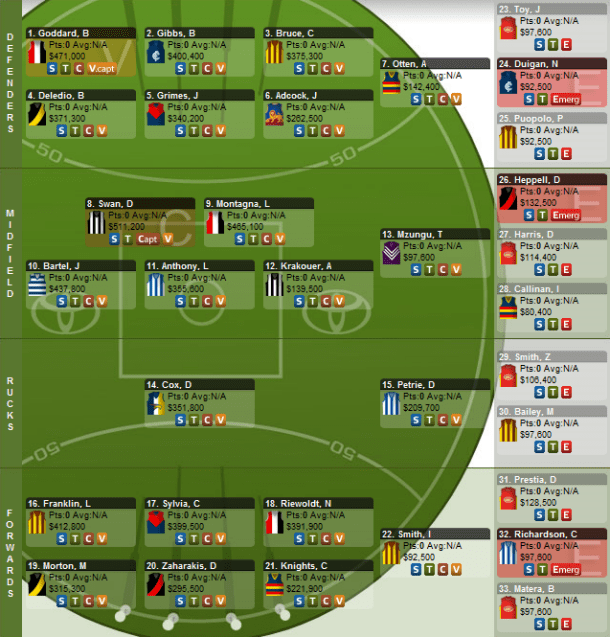 In the backs, I will definitely be starting with Goddard, Gibbs, Deledio, Otten and Toy. Obviously Duigan and Puopolo are the talk of the preseason, but will need to wait until closer to round one to ‘lock’ them. I really want Grimes in my team and with Cale Morton injuring his finger yesterday, the midfield time will be even more evident. Just worried about his body. Adcock is close to a lock at that price and the potential he has with positions opened up at the Lions, his scoring will get back to his best. You’d be silly not to start with Swan. Walk up captain. Enough said. Bartel will be a certain starter. Roy has talked me into him… so I’ll be sticking with him! Montagna and Anthony are a bit ‘meh’ at the moment. They’re just there – Anthony offers so value though. I am making use of the dual position players as much as I can with Mzungu, Krakouer, Callinan (all MID/FWD) and Heppell (DEF/MID) as links. It’s important to me to make sure the premium type dual position players aren’t in the midfield. Harris is an obvious must have too. I’m not starting with 211 in the rucks, but going for some value. Cox is crazily under-priced. I don’t think he will be back to being a 100+ average man, but will be in the 90’s due to kicking a few more goals this year… I hope! Petrie is being used as a ruck currently. Unfortunately I’m not make use of his RUC/FWD status. Smith and Bailey are the two best bets for your ruck bench at the moment. Hopefully they will carry the can for me all year. In the forwards, Riewoldt is the biggest lock. Way under-priced and a must for all teams. After watching Franklin in the intra club game last week, he will have a big year (don’t get suspended, dude) playing further up the ground. I love Sylvia and he is all but locked. Knights should be fine. There aren’t many guys that cheap that have the potential he does – in the forwards! Morton and Zaharakis are risks who I see upside in. I can’t ignore Morton’s last few games last season and the way Hird has talked up Zaka! Smith, Prestia, Richardson, and Matera are the pick of the rookies at the moment in my opinion. There is $26,600 left in my bank. It is set for Round 1, so some of those Gold Coast players could be on the ground. I will be taking advantage of the Captain’s Loophole. So, Gibbsy will be my VC for the Thursday night game and if I like it, I’ll keep his score, but if not, Swanny will be the man! Alright… so there it is! Rip it to shreds, copy it, whatever. I am keeping a few cards close to my chest as this will be a massive season! I might look at posting a few more sample teams over the next few weeks. I wouldn’t mid having a crack at a team that would be ideal to win a League Premiership (and maybe even one for a weekly prize). My only REAL worry is that you have got 5!!!! GCS players. i am tossing up between didak and frahat do What do you guys think?